Doing the St. Patrick’s Day episode, with everything Irish I could come up with from the archives. Scott Burns, Eric McKaig, Dan McGuire, Robert Geller–wait for it–from Emerald Downs and, of course, actual sound of St. Patrick driving the snakes out of Ireland with a little help from radio brother Matt Riedy. Enjoy! OK, still reeling from the UW Huskies loss last weekend in the desert to Arizona State University. I’m taking you back to the early 1980s, the last time we beat ASU down there, with Larry Nelson, Bob “the Voice of the Huskies” Rondeau and a cast of several. You’ll hear a KOMO Music promo and a couple of Halloween bits we did at 4th Avenue North. I climbed in the car and began my short commute to work. It was a Tuesday, a day I usually swing by Starbucks and pick up something, but this morning I was running late. As the car started, the reporter from KIRO was talking about Fisher Plaza. That was odd. It turned out that the channel 4 helicopter had crashed on Broad Street. Several cars passing by caught fire from the jet fuel that spilled, but the two occupants of the helicopter were dead. 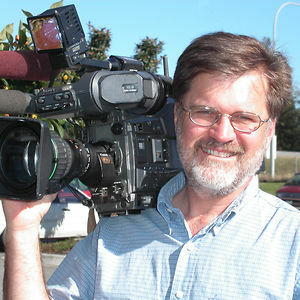 Then I remembered that Dan Strothman worked there as a cameraman. Could he have been one of the two people on board? Dan is the son of a college buddy, Bill Strothman, who wandered around the University of Washington in the mid-1970s along with me and the other Communications Majors. I probably should remember more details about the TV experience, but what I do recall are those Happy Hours after a shoot at the Pitcher House over on the Ave, with $1 pitchers. The perfect way to wrap up a Friday and head off into the weekend. The Speakout crew was made up of some very talented and determined folks who still run around Seattle today, including Bill and his girlfriend, eventually wife, Nora. While our paths scattered and after graduation, I headed over to Yakima to play radio, Bill and his camera did quite well and became the go-to guy at KOMO TV. After a few decades of excellence, he decided to venture off and do his own thing as a freelance photographer. I had just exchanged a couple of emails with him a few months ago, hoping that some day we could work on a project together again. To demonstrate that photographic skills can run in the family, Bill & Nora’s kid, Dan, grew up and followed his dad’s footsteps. There was even a time when Bill was still at KOMO, that Dan found himself working at a TV station in Montana, driving around the old KOMO 4 news truck that had been sold to that station. Eventually, Dan found himself at his dad’s old stomping grounds, continuing the Strothman legacy. That’s why my heart sank when I first heard about the accident. I skipped the Starbucks run so I could get to work, check on Facebook and see if Dan had posted anything lately. His Facebook page was a steady stream of “I’m so sorry” and “Our best to the KOMO family” and so I was relieved. He was alive. Dan was OK.
A short time later, I found out it was Bill on board. Apparently, doing a little freelance work as he had hundreds of times before. The regular KOMO chopper was in the shop, so they had a loaner from Boston. Just like that. Here. Gone. No chance for a goodbye, other than the usual “See you tonight” as you head out the door. Even though those days at the UW were 40 years ago, that special group of friends has remained in touch over the years. For a while, I attended Bothell First Lutheran Church with the Strothmans and other college friends, the Ensigns. The last time I saw Bill? The last time I really had a chance to sit and chat would have been a summer barbecue at my new Bothell House in 2007. It was a perfect day and there were my college friends, just hanging out. The hair was a little grayer, there were more “character lines”, but it was that old gang of mine. We should have had more of those get-togethers we always meant to organize. The longer you’re around, the reminders become more and more frequent. Bill Strothman was a pro, a compassionate, caring father and husband and one of the greatest guys you’d ever have the chance to meet. You’ll hear that a lot over the next couple of days. Anyone who knew Bill had only the best to say about him. He was also a man of faith and I know that right now he’s experiencing his reward for a life well-lived. I look forward to the day I’ll see him again. Then maybe we’ll finally get around to working on that project together. God’s peace to his wife Nora, and his kids, Dan and Heidi.